This is the perfect gift for beer lovers of every stripe. 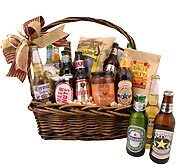 Whether you want to reward a loved one for a job well done or spread some cheer in the shadow of difficult circumstances, you can't go wrong with a selection of beers brewed around the world and a few Gourmet-quality snacks. 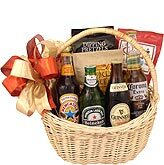 Maybe you can't run off to the pub and celebrate the moment, but you can send good will and love through this loaded beer basket. This is also a solid pick if you want to impress a colleague or show your appreciation to a professional acquaintance. My niece who lives in California sends me a wine basket for my birthday. However, my niece prefers beer to wine. I had never heard of BEERGIFTS before, but I thought I'd give it a try. My niece was delighted! She said the snacks were delicious and she was enjoying trying out some new beers! Definitely a win-win experience! Wanted to get a gift for my father-in-law who hasnâ€™t been feeling well and Iâ€™m working away from home and donâ€™t get the call much to check on him so I thought Iâ€™d send them something to let them know I was thinking about him. 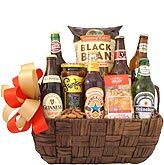 He loved and everybody that seen the beer basket loved it thank you very much for making his day . It's getting harder to find gifts for my grown nieces and nephews. This year I sent a Round The World Beer Basket to my nephew. It was a unique gift - So easy to order, shipped right on time, greatly appreciated. Have bought one every year since I bought the first one for my granddaughter's husband for Christmas. She said he loves it and would be very disappointed if he didn't get one every year. It was a birthday gift for my nephew and he loved it. Arrived promptly.